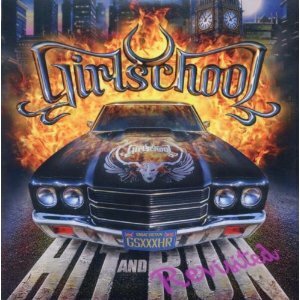 To celebrate the 30th anniversary of their classic album, Hit and Run, Girlschool have chosen to revisit the album and rather than just remixing it, have chosen instead to re-record it. I'm always wary when people decide to mess with a classic - "if it ain't broke then don't fix it", and changing a classic can actually spoil it, so how do Girlschool fare with this case? Luckily the answer is - extremely well. These classic Girlschool tracks have never sounded so good before. Obviously over the last 30 years studio technology has changed immensely as analogue equipment has been replaced by digital technology and that contributes to the album sounding so good. The other big change is that Jackie Chambers is on guitar in place of the late Kelly Johnson. Girlschool vocalist/guitarist Kim McAuliffe says about the album "We've made quite a few changes, but I'm not gonna say anything about them because we're hoping that our fans will notice for themselves just to see how well they know the original ones". I've certainly noticed a few small changes, but will leave you to find them for yourselves as the band intended - suffice it to say you'll need to know the originals pretty well to spot the changes. What can I say about the songs that hasn't already been said over the last 30 years? Not much really - this is a classic rock album and if you've never bought it, now is the time to get it - Hit and Run Revisited is an essential addition to every fans collection regardless of whether or not you own the original. There are two bonus tracks - a re-recorded version of "Demolition boys", which like the rest of the album sounds better than ever, and "Hit and Run" with Doro doing the vocals. The version of Hit and Run with Doro singing is great. Doro does all the vocals with Girlschool only joining in for the chorus. Its nice to hear a different version of a song sometimes and Doro does a good job with this, especially as it wasnt written for her voice. I'd certainly like to hear Doro perform it with Girlschool live sometime. Oj en 5a, jag får nog ta och titta in denna platta då.